The Pac-12 Networks is a full-time linear network available to cable, satellite and telephone companies, dedicated solely to the Pac-12. 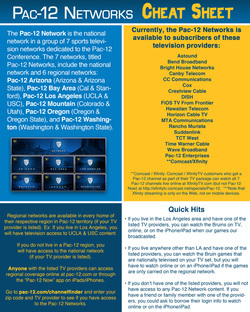 It consists of a national network and six regional feeds that provide 24/7 access to Pac-12 teams and universities. The networks televise more than 800 live sporting events annually and showcase 12 Conference Championship events each year. The Pac-12 Digital group encompasses the digital network, mobile, the university websites, social media, and innovative digital programs across the company. You can watch the Pac-12 Networks Online! If you have an iPod/iPhone/iPad, click here to download the iOS app "Pac-12 Now." 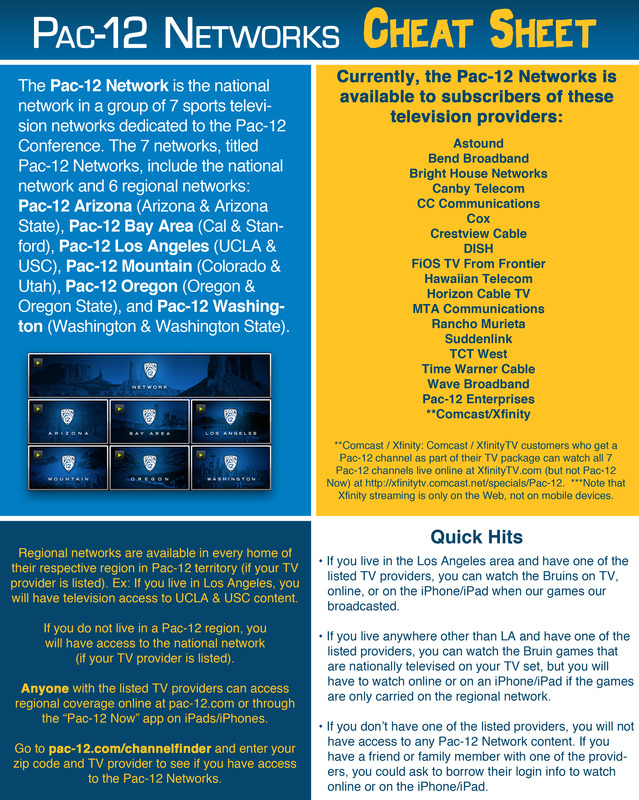 Here's the channel finder to see if the Pac-12 Networks is in your area. Built on a firm foundation of academic excellence and superior athletic performance, the Conference ushered in a new era on July 1, 2011, officially becoming the Pac-12 Conference with the additions of the University of Colorado and University of Utah. Just 27 days after the Conference officially changed its named, Commissioner Larry Scott announced the creation of the Pac-12 Networks on July 27, 2011, solidifying a landmark television deal and putting the Conference on the forefront. The Networks, including one national network and six regional networks, in conjunction with four of the nation’s largest cable operators, marked the first time a U.S. collegiate conference or any other programmer has launched a collection of networks across a variety of platforms, rather than a sole network. In addition, the “TV everywhere” rights will allow fans to access coverage outside the home on any digital device, including smartphones and tablet computers. On the field, the Pac-12 rises above the rest, upholding its tradition as the “Conference of Champions” ®, claiming an incredible 119 NCAA team titles since 1999-2000, including nine in 2011-12. That is an average of over nine championships per academic year. Even more impressive has been the breadth of the Pac-12’s success, with championships coming in 28 different men’s and women’s sports. The Pac-12 has led or tied the nation in NCAA Championships in 46 of the last 52 years. The only exceptions being in 1980-81, 1988-89, 1990-91 and 1995-96 when the Conference finished second, and only twice finished third (1998-99 and 2004-05). For the seventh consecutive year, the Pac-12 had the most NCAA titles or tied for the most of any conference in the country, winning at least six every year since 2000-01. No other conference has won double-digit NCAA crowns in a single year, the Pac-12 doing so six times, including a record 14 in 1996-97. Spanning nearly a century of outstanding athletics achievements, the Pac-12 was the first conference to reach 400 championships in 2010-11. With the inclusion of Colorado and Utah, the Conference surpassed another major milestone, with league teams capturing 450 titles, outdistancing the next conference by nearly 200. In all, Conference teams have won 451 NCAA Championships (306 men’s, 145 women’s). The Conference’s reputation is further proven in the annual Learfield Sports Directors’ Cup competition, the prestigious award that honors the best overall collegiate athletics programs in the country. STANFORD continued its remarkable run and won its unprecedented 18th-consecutive Directors’ Cup in 2011-12. For the second-straight year, six of the top 25 Division I programs were Pac-12 member institutions: No. 1 STANFORD, No. 3 UCLA, No. 7 USC, No. 11 CALIFORNIA, No. 19 ARIZONA and No. 24 OREGON. With three teams in the top 10, it was the most of any conference.